Okay, this was cause for a pause. On our little weekend getaway trip down to Big Cedar, we stopped at a convenience store for a little R & R (Restrooms and Rolos). I was walking around looking at stuff. This store had EVERYTHING. Toys, every kind of snack, candy, and drink. There was decor for your home and RV. Car parts and hunting gear. Fishing licenses, duck stamps, and bait. Then, I saw it. A gravy dispenser. Thank goodness Mr. Wii had his iPhone so I could get a picture. I had never seen anything like it before. You open up the package of biscuits that are in a microwave safe plastic bowl. 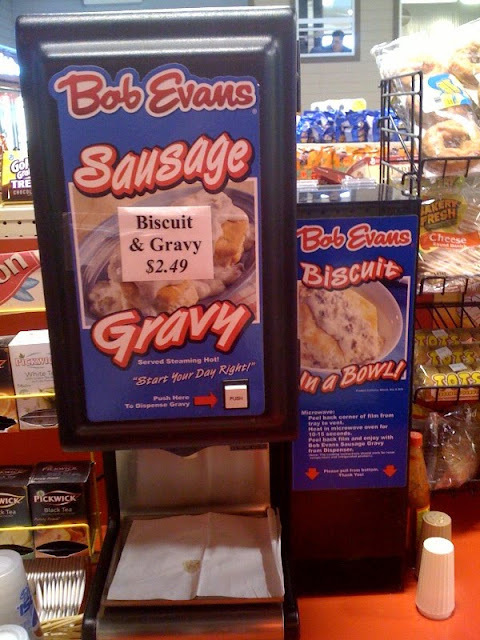 You microwave the biscuits, dispense the hot gravy, and there you go…biscuits and gravy from a machine. Who knew? Bob Evans, I guess. This entry was posted in Gravy. Bookmark the permalink. Welcome to the innovations of the Ozarks baby! Heeeheehed! This Ozarks farm chick knows what she's talkin' about! Looks like ya'll had a grand time at Big Cedar, isn't it something? This is going on my gift list. I wish I could have been present when gravy was invented. It must have been a joyous day.